Listeners takes Dr. Doctor's advice! JoEllen's root flare exposure adventure. Root Flare Q & A with photos from Frank Maddy. FM: The burr oak was not too deep compared to the others. Should I go deeper, what about the sucker root? 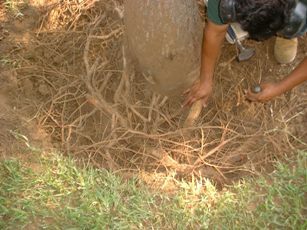 root that appears to be crossing, remove it. FM: All the fruit trees were bare root and are in their 4th year.Peach tree #1 had some roots crossing over and choking at the trunk. 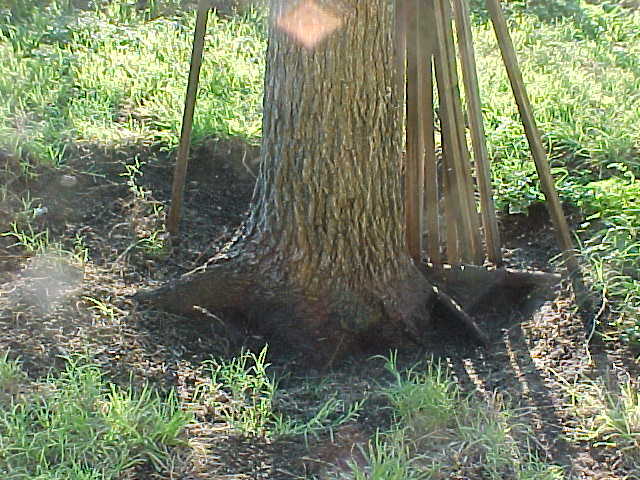 The tree leans, should I expose the root flare on the covered side? the flare starts. Do I cut them off and go deeper? HG: Those are adventitious roots (false roots) above the true flare. I would probably wait till fall to remove them. FM: Plum trees, I can not find a flare on either. There are sucker roots and the swelling,but no roots that are choking the trunk. Again, do I go deeper, and cut off the sucker roots? FM: Thanks. I listen to both shows and I could not believe how deep these trees were planted. HG: Good work Frank. I wish all gardeners would do this. Next maybe we can get the growers to put the trees at the correct height in the containers. Q: I would like more information on how to go about uncovering root flares and what to put around it after you've uncovered them. J.W., Dallas. HG: The simple answer is that it needs to be done VERY carefully. 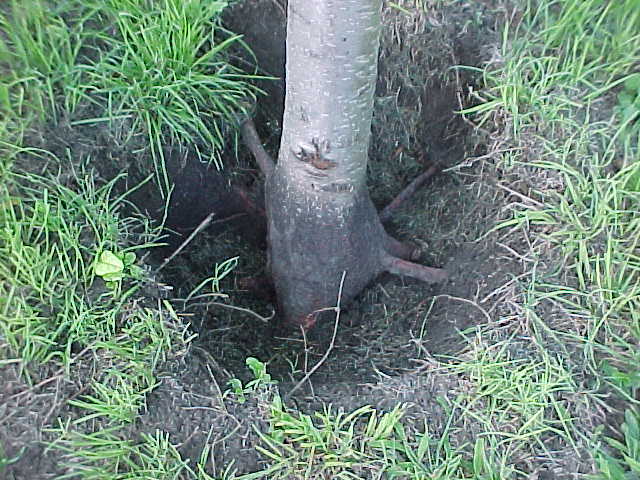 Trees too deep in the ground, an all too common problem, have two basic problems. 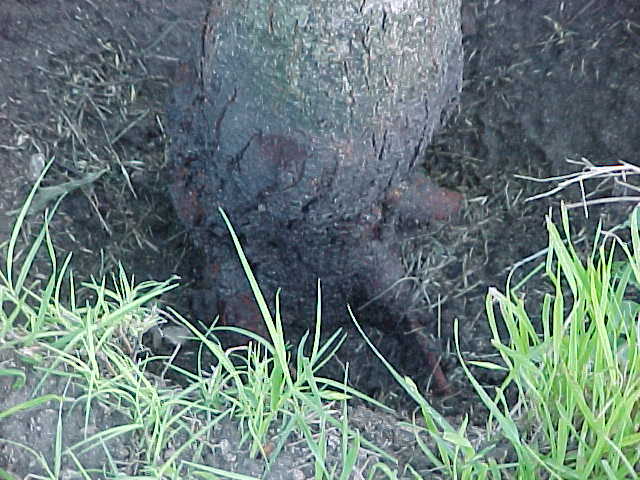 When the trunk flare is under ground, it stays moist and doesn't breathe properly as bark is supposed to do. 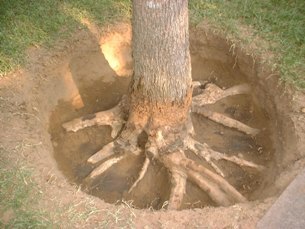 Soil too high on the trunk also often hides circling and girdling roots which choke the tree and drastically slow down growth. Trees grown in containers are highly subject to this damaging condition. If you do the soil removal yourself, use hand tools and gloved hands being extremely careful not to damage the wet bark tissue. Water can be used but only with a soft flowing stream. 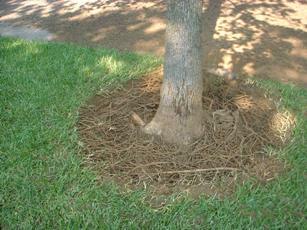 Strong water blasts can severely damage the soft bark on the base of the trees. 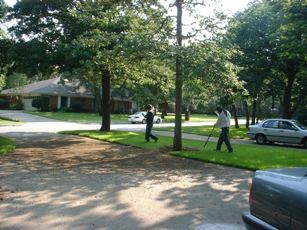 By far the best route is to hire an arborist that uses the air spade. It is a fancy sandblasting type tool that blows air (no sand) at a high velocity and removes the soil without damaging even the smallest roots. 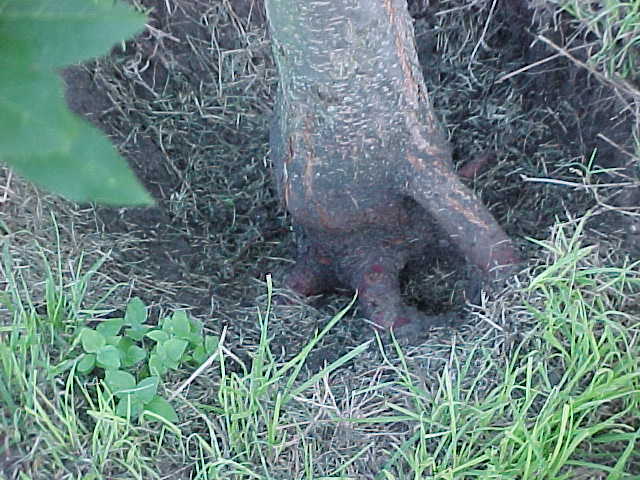 Once exposed, the small roots trying to grow up to get air should be removed and the depression caused by the trunk/root flare exposure should be left open. As the flare expands from the growth of a more vigorous tree, the open dish will fill in. All I would put in the depression is a thin layer of shredded cedar mulch. ANSWER: You did the right thing. The root flare should always be exposed. The graft union being up in the air is no problem at all. Good job!